Today’s news carried an article on my photography work on the NZ Stamp annual, NZ postage stamps, and the NZ bank notes just annouced. Full story here. 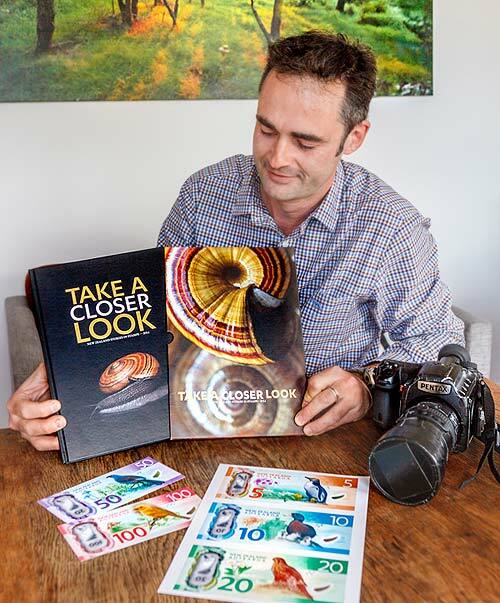 Wellington photographer Rob Suisted, whose work features on stamps and on the newly designed New Zealand banknotes. The article by Dave Crampton mentioned I’ve done previous NZ Post annual stamp book covers, so here’s some of the back story to those covers. 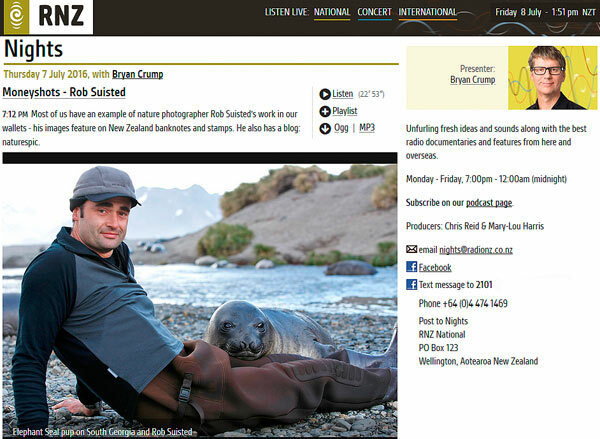 I’ve worked with Nicky Dyer of Strategy Design in Wellington on these for several years now. The 2012 cover used one of my favourite images, and the last couple of covers have been very interesting. 2013 cover involved filming rare NZ native geckos on a black background which involved an afternoon wrangling this cute little joker. 2014 proved to be much tougher. 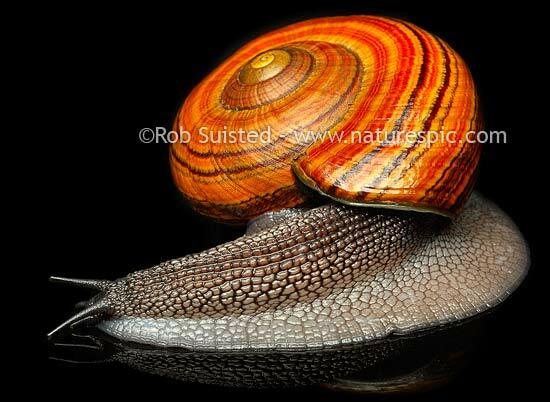 Nicky called me and said they’d like to do a stunning cover focussing on our rare and little known giant carnivorous land snails, Powelliphanta. Jeepers I thought, it’s winter and they’re not going to be very mobile in the cold. Always up for a challenge I accepted. The job involved setting up a makeshift macro studio in the back of my jeep, talking to snail experts, before heading across on the interisland ferry for a few days. Of course that night turned very cold, meaning that snails would not be active. Luckily I’d managed to get out at dusk and spend a few hours searching for snails. It took about an hour to find my first, and several others shortly after. I was fortunate as overnight a good dusting of snow meant searching become impossible. These unique snails require warmth to be active, and luckily with the sunny day, and black surfaces, it was enough to coax one out of it’s shell despite the cold air temperature. It did take about 4 hours though (mostly moving on the spot to warm my feet), and I got some stunning and unique portraits to do these giants proper justice. The textures, colours and form are beautiful and I enjoy looking at them. Have a look at more photos of these rare carnivorous giant landsnails (Powelliphanta sp.). For a closer look at the new New Zealand bank notes, check this out. You're browsing entries tagged with New Zealand postage stamps at Nature’s Pic Images Blog.